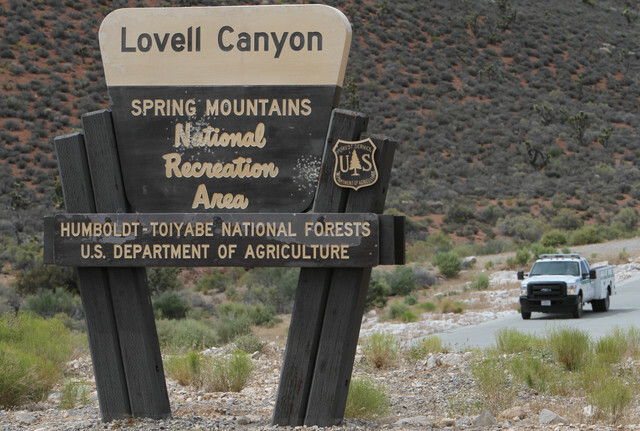 The Humboldt-Toiyabe National Forest’s Spring Mountains National Recreation Area has extended the temporary emergency shooting closure in Lovell Canyon for an additional year, officials announced. Richard Brian/Las Vegas Review-Journal The entrance sign to Lovell Canyon is seen on Monday, June 27, 2016. A closure in the area includes approximately 32,000 acres on both sides of Forest Service Road 45537/Lovell Canyon Road. Special to the Pahrump Valley Times. A photo taken in 2016 after the temporary emergency one-year shooting closure just for Lovell Canyon off Nevada Highway 160 south of Pahrump. 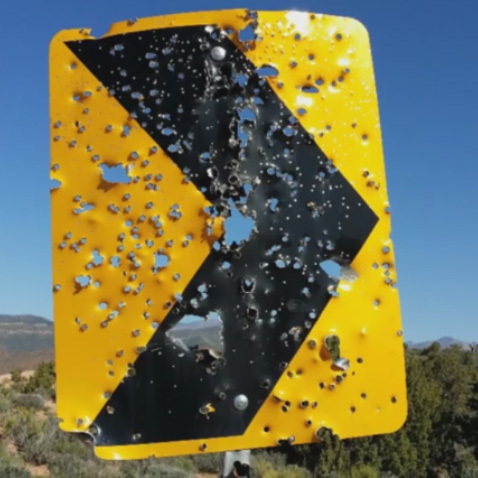 The photo shows the shooting of a park sign. The extended closure will allow the U.S. Forest Service to go through a formal decision-making process to determine what dispersed recreation activities are appropriate in Lovell Canyon and how they can best be managed, the Forest Service said in its announcement earlier this month. The closure area includes approximately 32,000 acres on both sides of Forest Service Road 45537/Lovell Canyon Road. “During the second year of the temporary shooting closure, the SMNRA will be soliciting public input and begin creating a long-term plan for the management of dispersed multi-use recreation in Lovell Canyon,” area manager Donn Christiansen said in a statement. The Spring Mountains National Recreation Area plans to hold two public meetings in 2018 to gather input from the public on what recreation opportunities they would like to see in Lovell Canyon. One meeting will take place in Pahrump and another in Las Vegas. Following the public meetings, an interdisciplinary team will analyze the public input and develop a proposed action for managing dispersed recreation. Forest Service officials expect the planning and implementation efforts to be a multi-year process. The first year of the temporary emergency shooting closure focused on cleaning and rehabilitating the landscape. Since the initial closure, the Forest Service along with nonprofit, local, state, and federal partners have conducted three cleanup efforts in Lovell Canyon. Each of the cleanups have had over 100 participants from organizations such as Boy Scouts of America, Friends of Nevada Wilderness, Nevada Childhood Cancer Foundation, Outside Las Vegas Foundation, Pahrump Valley 4-Wheelers, Project Sunshine – Camp Heart &Soul, Republic Services, Save Lovell Canyon, Save Red Rock, Sierra Club, and Spring Mountain Free Trappers. The cleanup efforts produced seven 40 yard dumpsters full of trash that has been removed from the area.